River Valley senior shortstop Cierra Roberts goes to apply a tag to an Alexander baserunner during the second inning of Wednesday night’s TVC Ohio softball contest in Bidwell, Ohio. BIDWELL, Ohio — A big bump in the road. 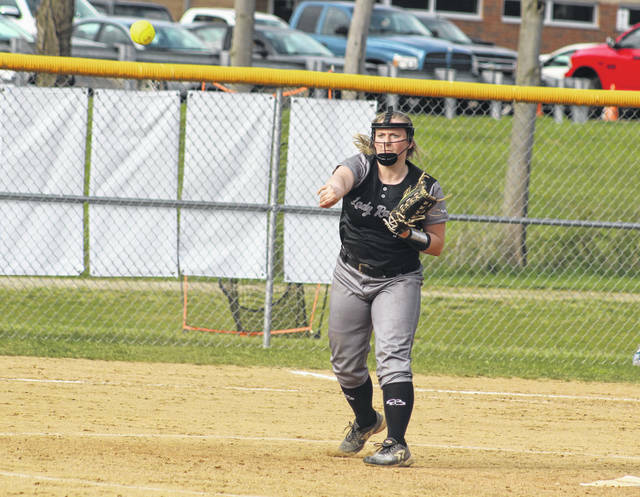 The River Valley softball team had its four-game winning streak come to an emphatic halt on Wednesday night during an 18-2 setback to visiting Alexander in a Tri-Valley Conference Ohio Division contest in Gallia County. The host Lady Raiders (6-6, 2-3 TVC Ohio) never led in the five-inning affair as the Lady Spartans (8-3, 4-2) built a 5-0 lead in the first inning and never looked back. The Silver and Black, however, managed to make things interesting in the bottom half of the second as a leadoff walk to Kasey Birchfield and a two-out error cut the deficit down to 5-1. Birchfield scored from third on a dropped pop-up that allowed Sierra Somerville to reach second. Somerville came around one batter later as Grace Hash doubled to centerfield, making it a three-run contest through two complete. RVHS was held hitless and mustered only one baserunner the rest of the way, and the Red and Black sent 11 batters to the plate in the top of the third. The end result was six runs on six hits, an error and a hit batter — giving the guests a sizable 11-2 cushion. Alexander tacked on four more scores in the fourth and capped a three-run fifth with a two-run homer from Scurlock, completing the mercy-rule outcome. 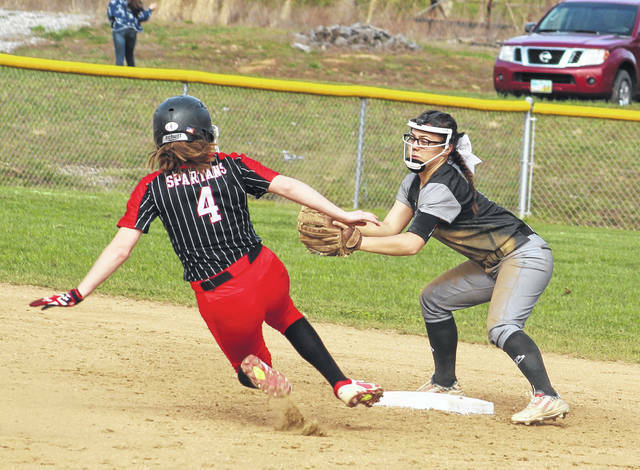 The Lady Spartans outhit River Valley by a 16-1 overall margin and also committed only three of the nine errors in the game. AHS stranded seven runners on base, while the hosts left only two on the bags. Casto was the winning pitcher of record after allowing two unearned runs, one hit and one walk over five innings while striking out four. Baylee Hollanbaugh took the loss after surrendering 11 runs (one earned), 10 hits and one walk over 2.2 frames while recording one strikeout. Hash had the lone hit and drove in a run for the Lady Raiders. Casto, Moleski and Mace led Alexander with three hits apiece, followed by Scurlock and Miller with two safeties each. Hill, Ross and Roof also had a hit apiece for the victors. Moleski and Scurlock paced the guests with four RBIs each. Casto, Scurlock and Miller scored three runs apiece. River Valley returns to action Friday when it hosts Wellston in a TVC Ohio contest at 5 p.m.